How to vote in NetSquared challenges — voting closes Friday 3 PM Pacific time! At least for me, the voting process was extraordinarily difficult; I counted 15 steps, and in many cases the instructions for what to do next weren’t at all obvious. It’s a complicated two-step process where you have to first “mark your ballot” and then submit it. Even finding the button to vote isn’t easy — it looks like an ad for NetSquared. And I’m a trained professional! NetSquared’s voting instructions help some if you can find them but are primarily text — there’s only one screenshot (and it highlights the “send to administrator link” which doesn’t have anything to do with voting). Fortunately the folks at Capitol News Connection have written up excellent instructions for their project … and it’s straightforward to see how to apply these to any of the ideas in the N2Y4 Project Gallery and Change the Web Project Gallery. So if you’re trying to vote, check out the instructions below. And if you’re advocating for a project, consider creating a similar instruction sheet and distributing it to your supporters before tomorrow’s deadline, encouraging them to double-check their votes. If you don’t have the time or resources to do something slick, that’s fine: step-by-step text instructions with links are a lot better than nothing. Voter education makes a huge difference in competitions like this, and it also is a good way of showing your supporters that you appreciate all the hard work they’re doing getting through the obstacles NetSqaured has set up from them. Showtime for election protection and citizen journalism! They’re already voting in Dixville Notch, New Hampshire, so Election Day has officially begun. Showtime! 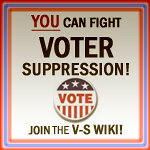 We’ve just finished our last minute polishing for the Voter Suppresssion Wiki, with a redesigned home page, a Voter Suppression Documented summary with snippets of a dozen different examples, final touches to the Media Room, the Prepare for election day action alert, and a chat room. We’ve continued to get some great press, with Caitlin Johnson’s Txt the Vote: Election Protection Goes High Tech on OneWorld/Yahoo News! featuring one of our members, and Simon Jones’ Citizens, Media Use Social Media to Monitor Election giving some great context. We continue to have successes: flagging a deceptive report falsely claiming that people were arrested, getting our one-page What to do if you have problems document posted in a library in South Carolina. Baratunde’s 90-second guide to election day video got over 1,000 views after YouTube selected it as a featured video. Another wiki member submitted her story to the Huffington Post. Multiply this by a few hundred people on our project — and dozens of other projects in the grassroots election protection and citizen journalism movement — and it adds up to a big impact. On election day, the Incident Tracker will be where the action is on the wiki. We’ll be updating it regularly, sifting through the various sources on the web and threads in our discussion forum, and linking to any action alerts. Please check it out; and if you see any voter suppression or articles about it, please let us know about it! Of course there are a many other sites around the web that also have great reporting. Here’s a quick roundup of a few other sites. Our Vote Live, a joint project of the Election Protection Coalition and EFF, features a live feed and queryable interface to the reports that go into the 1-866-OUR-VOTE hotline. With over 40,000 reports already, it’s a rich data source — for example, here’s their Ohio page, and the list of the 200 reported incidents so far of voter intimidation. Maybe you already know all this — you’ve stored the hotline numbers on your phone (including the Spanish and Asian language ones just in case you run into somebody who needs help), you’ve printed out information about your rights, and you’ve got a six-pack of bottled water and a spare umbrella ready to bring with you to the polls. You can still help by passing the word on to your friends and family, online and off. Get the word out online via email, Facebook, MySpace, Black Planet, Twitter, and other social network sites … and then get the word out offline too, to reach people such as seniors most at risk for voter suppression. A special note to any bloggers and journalists who are reading this: please provide similar information to your readers. You can cut-and-paste from our action alert and media release; or you can roll your own post from the other great information out there — the Election Protection Resources page on SourceWatch’s Election Protection Wiki is a great place to start. Please take the time and invest the effort to help protect voting rights. While you’re at it, take some of the space you usually reserve for running ads and promoting your site, and use it to promote democracy instead. Please feature election protection information like hotline numbers on your blog’s front page. cross-posted on Pam’s House Blend, OpenLeft, and MyDD and Oxdown Gazette, with various differences due to HTML incompatibilities but some cool polls to make up for it. Print out election protection documents on Friday and Saturday, at work (unless you’d get fired) and at home (if you have a fast printer): My Vote, My Right state-by-state voter bill of rights fliers, Election Protection and Ya es hora more detailed state-by-state legal information, and/or some of the other information linked to in this post. Don’t be greedy and hog the printer. Let your colleagues protect their votes too. Cyberspace — A diverse group of bloggers, community organizers, media professionals, technologists, and voting rights activists have issued a report with several last-minute recommendations to reduce voter suppression in the upcoming US Election. Some of the most significant opportunities involve increasing awareness of resources like the non-partisan Election Protection hotlines at 1-866-OUR-VOTE/1-888-VE-Y-VOTA, engaging the tens of thousands of participants in citizen journalism projects observing the election, and ensuring that voters and activists prepare for a chaotic environment on election day. We’re roughly at the midpoint of the Voter Suppression Wiki’s Workshop on Last-minute strategies for reducing voter suppression. After brainstorming and identifying opportunities over the weekend, we’re going to be starting to draft the report today. Tomorrow, we’ll begin work on the press release as well, and issue both the report and press release Wednesday morning at 9 a.m. Heading into the last ten days before the election, it’s clear that is there are still huge opportunities to reduce voter suppression. How to make best use of this time? There are so many groups doing great stuff here that there are lots of opportunities for synergy; at the same time, there’s also a lot of redundant effort, and lack of awareness of key assets like the 1-866-OUR-VOTE/1-888-VE-Y-VOTA hotlines. With so much going on in every state, use of social networks combined with community-based online/offline communication and media strategies could make a huge difference. If we had a year to plan for this, and an infinite budget, it would be great to get everybody together at a conference so that people could make connections and find out what’s going on, with a goal of getting teams in place to make progress on various initiatives. Oh well, maybe next time. For now, we’ll do it in cyberspace. Facebook event here — invite your friends!